Matias Ndakolo Mbulunganga military training at Tanganyika (Tanzania) 1960 and Algeria. Matias Ndakolo Mbulunganga was born in Iilagati village in 1943 at okathakambengwe in Ondonga, Namibia were he grew up until he joined the contract labour system South West African Native Labour Association (SWANLA) ''Okaholo'' and worked as a farm laborer at Grootfontein. At the end of his first contract 18 months later, he got another contract at the farm in Tsumeb and then moved to Walvis Bay on yet another contract system. It was in Walvis Bay, where he came into contact with some of his fellow Namibians who were already busy mobilizing their fellow contract workers to fight the South African colonial administration and this meant the beginning of Mbulunganga’s political orientation and education. In Walvis Bay, I met some of our elders such as Kenyatta, Sam Nujoma and Mzee Kaukungwa who introduced us to politics. It did not take a long time for us to believe in their political ideology, because we were suffering a lot under the boers. In 1959, he left Walvis Bay and went to the Kavango in search of another contract labour job. There he received a contract to go and work at Livingston, but ended up at Johannesburg for a period of 4 years. After so experiencing hardship with the contract labour system he decided to join the MPLA movement in Angola. When he left Namibia (South West Africa) in 1960 was inducted in MPLA military wing and underwent military training in Tanzania followed by another two years military training in Algeria,where he introduced to the ideology of Marxist-Leninist Doctrine. During that time Mbulunanga serving in MPLA he was tasked as a commander of B-detachment that served between Angolan, Zambia and Congo borders. He sustained some minor injuries in a battle by a shrapnel and he was not feeling well after beaten by tse-tse flies in the forest, he was transferred to Lusaka and while receiving medical treatment in Zambia, the same place where Swapo also had education centres and military headquarter, so it was an opportunity presented itself to for Mbulunganga to meet his countrymen like Elisa Haulyondjaba and Peter Eneas Nanyemba, (Ndilimani Lyomukunda Wamupolo), Solomon Hawala,Ndaxu Namoloh ( Ho Chi Minhand ) Epaphras Denga Ndaitwah and other compatriots after released from medical care at (Mungu Hospital) and joined Swapo-military wing PLAN in 1969. Watch Matias Ndakolo interview with NBC explaining how they fought South African Boers. 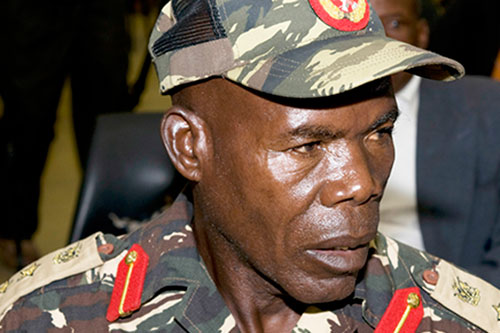 In an interview conducted in 2009, he affirmed that his first military induction was with the Popular Movement for the Liberation of Angola MPLA and first he fought alongside the Angolan forces fighting for the liberation of their motherland from the brutal regime of Marcelo Caetano before he joined Swapo. Indeed he became a prolific gallant fighter of the Peoples Liberation Army of Namibia (PLAN) fighting the apartheid regime of South Africa. After joined the Swapo military wing he begun to conduct military operations inside Namibia around Katima Mulilo and sometimes crossing the Cuando River into Angola at northern-east front. Giving an account of some of the successful operations he was involved in. Mbulunganga noted that at one point a certain high ranking Boers' commander came to Caprivi (Zambezi) after he told South African president John (Johannes) Balthazar Vorster that he only needed a pistol and a dog to hunt down the Swapo terrorists, but rued to learn that it was the worst military undertaking one could ever attempt. When that Boer and his group pursued us. We planted a landmine and we moved a few metres, before we laid an ambush. Only a short time passed, then we heard the noise of the landmine when it went off. We came back to see and we found that the Boers including the one who said he will hunt us down with a pistol was gone. Throughout the years as a commander in the liberation struggle, Mbulunganga has proven to be a fearless combatant and one of very few men who felt so comfortable that he could sing, while firing at enemy targets and at the same time ducking enemy bullets. “Since I started fighting I never encountered any difficulties. I loved fighting the Boers. During that time when you find me in the middle of the war I would be singing, because I hated the Boers. I always remember how they used to treat us when we were working in the mines,” Mbulunganga narrated. 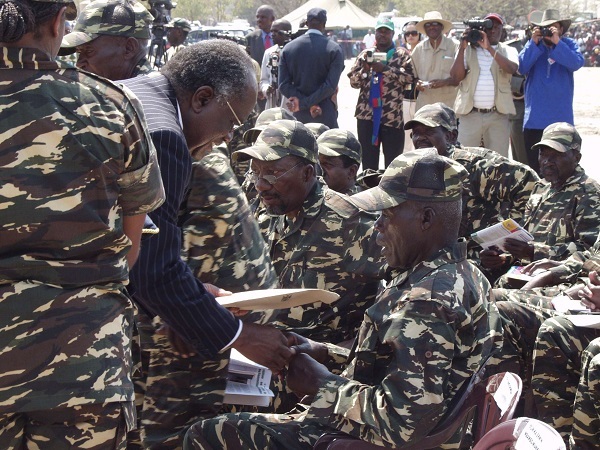 Former President Pohamba, presents liberation status to PLAN Commander Matias Ndakolo. In 1989 he returned back to Namibia after the country got its freedom from apartheid, however people like Mbulunganga have suffered another ostracism on the hands of fellow comrades who were together in the trenches. On earlier on-set the government failed to take a proper consideration about the plights of the war veterans and accord them with the status they deserved. Thanks to the government that later leaped-in to initiate housing project, through the Ministry of Regional and Local Government, Housing and Rural Development, together with the National Housing Enterprise by building about 48 houses and one house was gave to Mbulunganga , which was officially presented by former President Hifikepunye Pohamba to him and his wife Meekulu Aili at special ceremony on 10 Februrary 2007. He got a son Philip Shikoka ndakolo born in 1977 in ondjamba,Angola from his first wife Mekulu Akwenye Selina ''Katanga kakalula''. Phillip and other kids especially his sibling Wangushu Hambelelenimoved grew up in Nyango, zambia. Matias ‘Mbulunganga’ Ndakolo has died in the Oshakati Intermediate Hospital on Tuesday, between 01h00 and 02h00 due to prolong illness he succumbed over three-week. He was 75 years old. This was stated by his young sister, Rauna Ndakolo. According to his brother-in-arm Elia Haulyondjaba, who is also a PLAN fighter and a retired Namibian Police Force (NamPol) Commander in the Oshana Region said Mbulunganga returned from exile along other freedom fighters in 1989. He has been ailing since his return to Namibia at the dawn of the country’s freedom and independence. Peoples such as Solomon Hawala and other PLAN Combatants like Dimo Hamambo, Peter Nanyemba, Matias Ndakolo Mbulunganga, Hamutenya Zulu, Aron Shongambele, Elia Haulondjaba, Wilbard Tashiya Nakada, Brendan Kongongolo Simbwaye, J. Tambanelo and among many others fearless fighter that made those sacrifices, it was the cause of their heroism we got indipendence and thus it should hold and bind us together as one Namibian one Nations and this is the only journey we must continue. So we too, let us overcome the tribalism, the rule of impunity and carry forth the torch of freedom and unity.